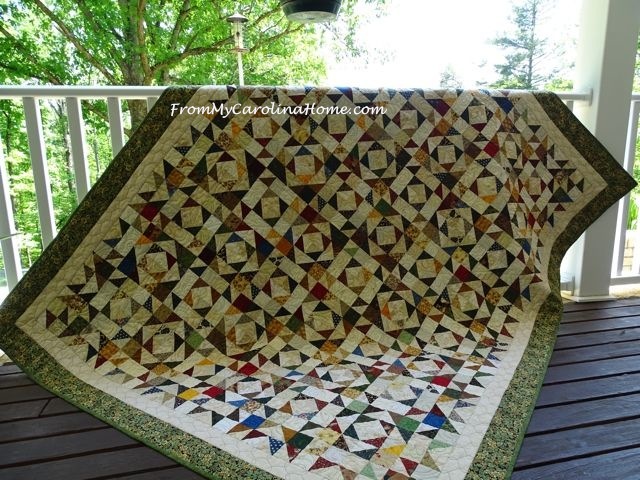 Continuing the Teacups Quilt Along, this month we’ll do a block from the Cups and Saucers book. Actually, we will do three. If you have this version – Cups and Saucers first edition – the patterns are the same. 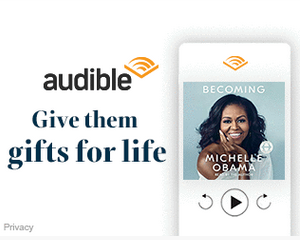 So, make three copies of the teacup pattern on page 55 of the first edition, or page 59 in the revised edition, called Hanging Cup. It is the one of the teacup hanging from a peg, and we’ll do three of the same thing. 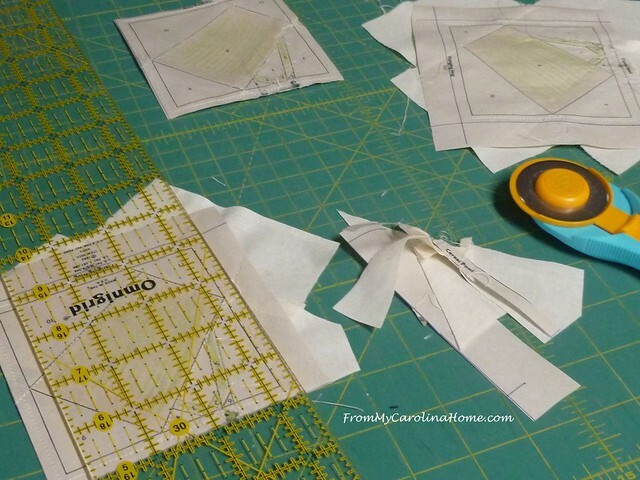 If you need a refresher on the steps to paper piecing, click on Paper Piecing Basics and Tips. 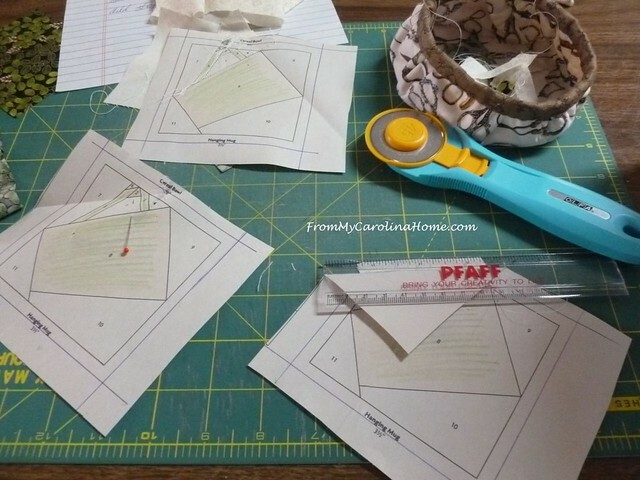 Make 3 copies of the pattern on a tear-away paper. Mark a 1/4-inch seam allowance outside line of the pattern for a cutting line. 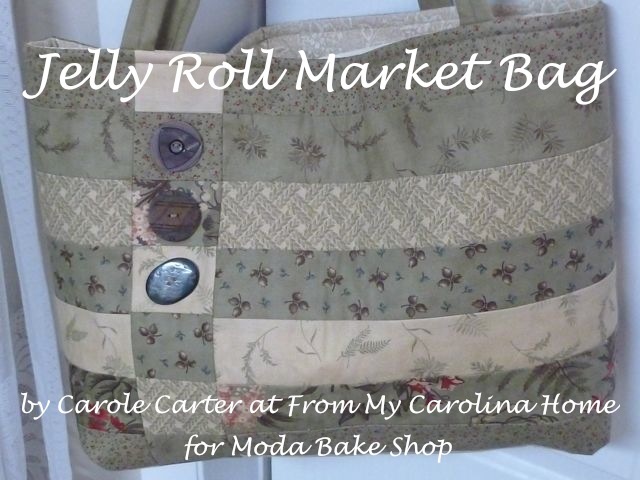 Be sure your fabric fills the seam allowance area as you go. 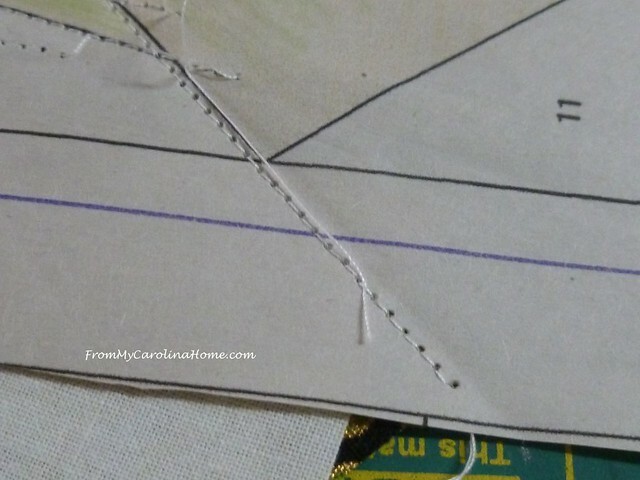 Tips – shorten your stitch length, and use an open toe foot. Also, piece #6 looks tiny, but will be larger as it is a piece that continues through the seam allowance, so don’t skip it – I know you’ll be tempted to as I was. 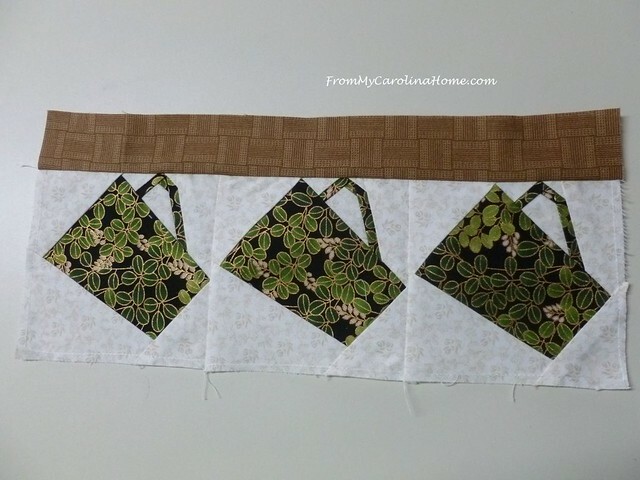 Be sure to extend your sewing line through the outer cutting line where it intersects an edge. Do all three at once, working on the same bit over all three blocks. 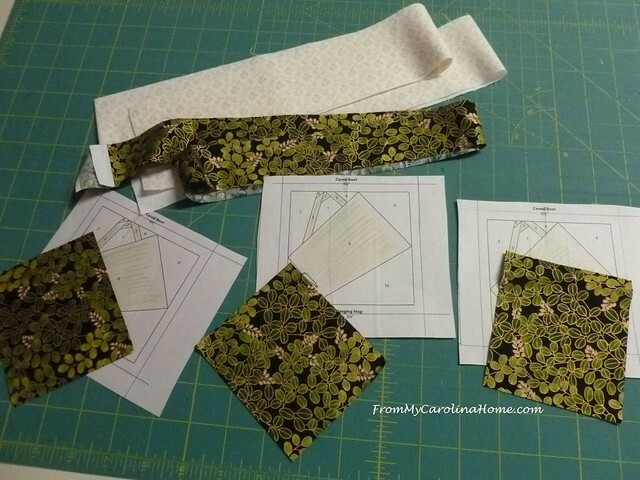 Then you make one trip to the ironing board for three seams, it will save a lot of time. It also will help you see if you make a mistake before you get too far. Trim on the cutting line, and remove the paper. 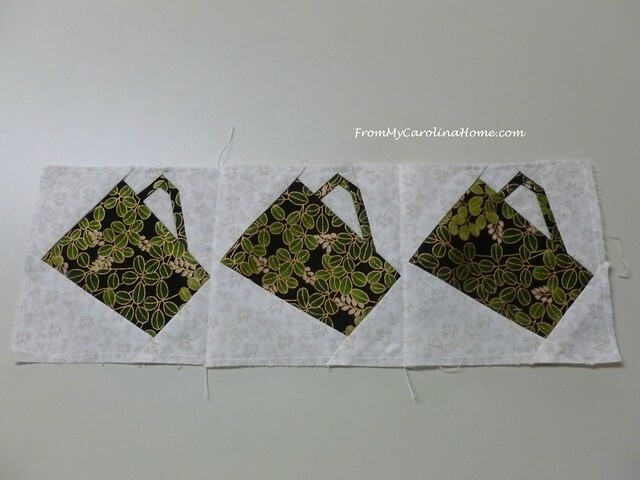 Sew the three blocks together side by side. Add the ‘shelf’ piece along the top for the cups to hang from. Final size of this unit is 5″x11″. If you don’t have the book, just cut a piece of cute filler fabric this size. 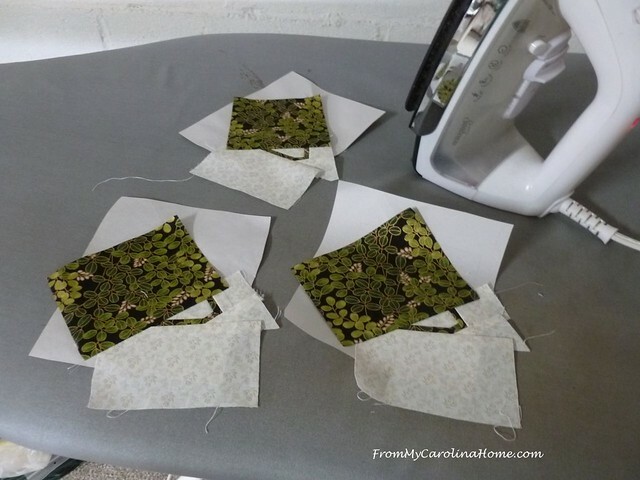 Or you could make a row of flying geese as a filler too. Update – I have done a pdf for an alternate block for those without the book – Teacups QA Alt September. Next month’s teacup will also come from the book, and I’ll have an alternate idea if you don’t have the book. 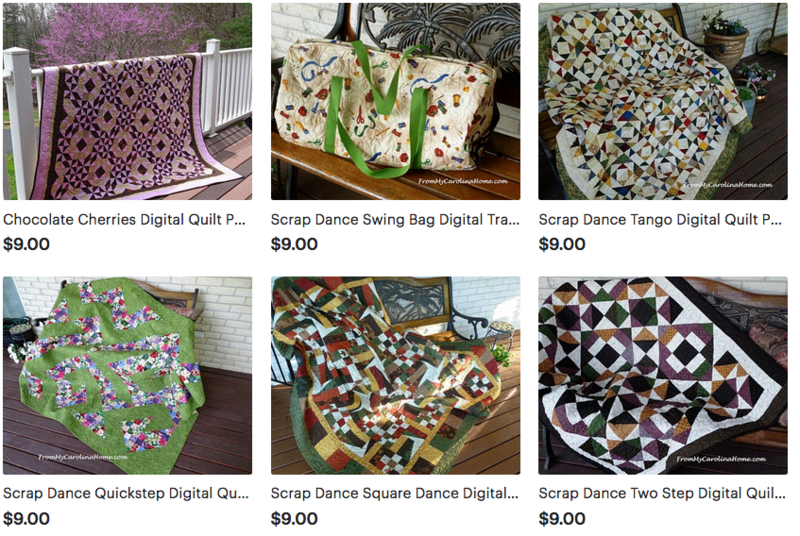 After that, the next several months will have the pattern as a download on the blog. Share your progress in the group on Flickr, created so readers can share anything inspired by my blog. Come join if you use Flickr, and share your teacups as we go From My Carolina Home Project Sharing on Flickr , or share in our facebook group – From My Carolina Home Project Sharing on Facebook. Here’s Mia’s teacup from August, shared on Flickr. Thank you for sharing your teacup. 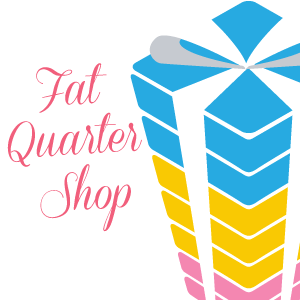 If you missed the first post in August with the first block, click on Teacups Quilt Along begins. 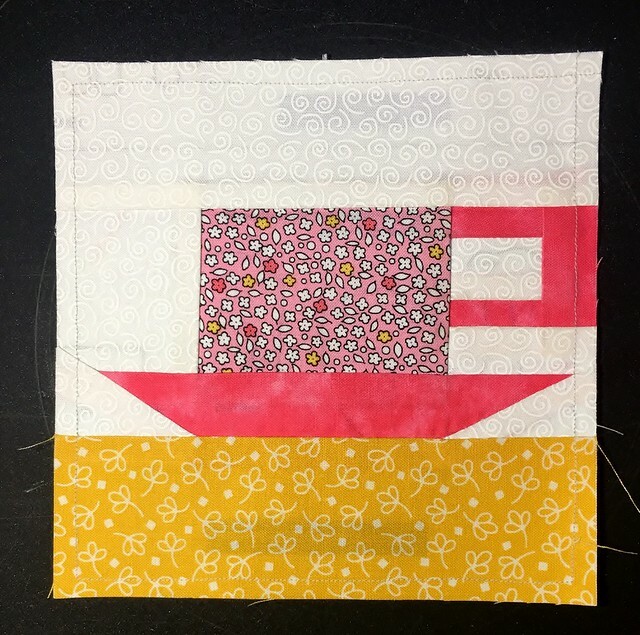 If you are ready for the next block, click on October Teacup Block. If you want to order the book, these both have the same patterns. There will be at least two more from the book before we are done. The rest will be given as downloads as I get to them. We will do mixed techniques, they won’t all be paper pieced. Cups and Saucers revised edition on Amazon. Have fun!! What do you think of the second block? Your hands do stay busy with wonderful creations. 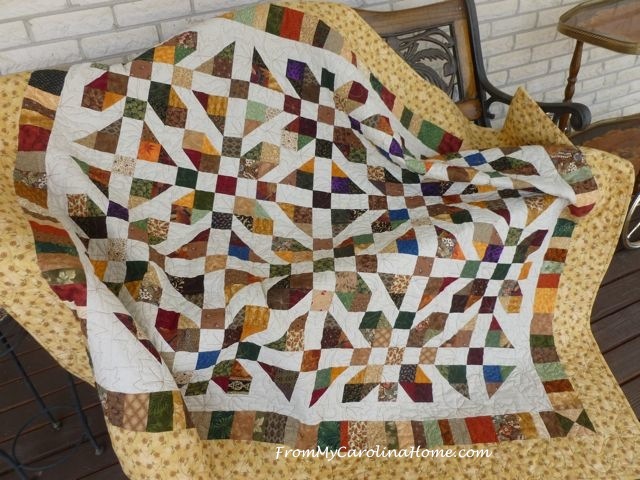 I did not see the pdf for paper piecing this block. No, as mentioned in the first paragraph, this pattern is from the book Cups and Saucers. There is an alternate idea later in the post if you do not have the book. I cannot do a pdf of this one as it is not my pattern. Adorable teacups. I am in awe of your creativety. What fun I have had today, first of all no book, want a wild search and you know how that goes. Did my own drawing of a cup and got two made, that’s another story. I will get the other cup made in the next week or so and will post on FB. Tomorrow is our local Art Walk lakecountryartwalk.ca so that’s where I will be. 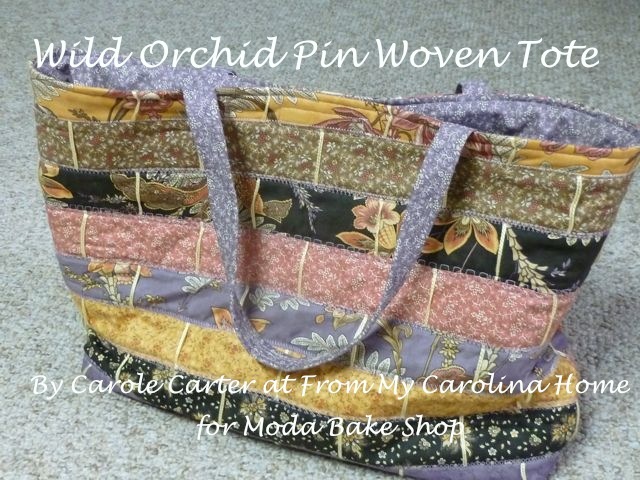 Hello Carole, After reading your post today, I went searching on the Internet for any Free Hand Embroidery or Free Applique Tea Cups or Coffee Mugs that would work in a similar way as your paper pieced pattern. 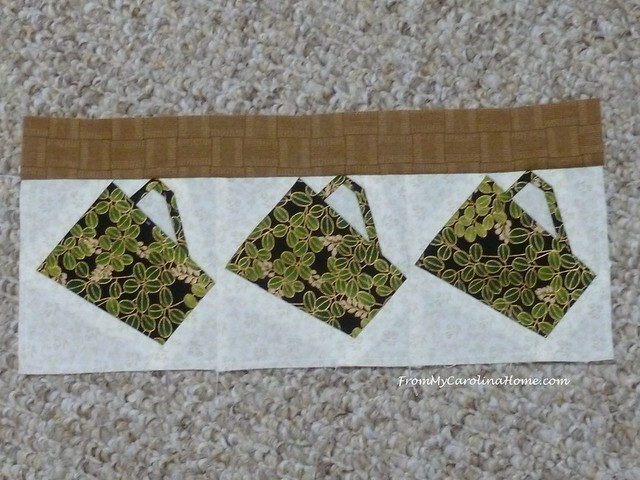 I think I may have finally found a pattern, yet it will need a tad bit of changing a few pieces to get the same effect. I think the fabric you chose is gorgeous! If I did see a cup in any color and design like you chose, I know it would be coming home with me! LOL. If my idea does not work the way I am hoping it does, I will definitely be going with your Flying Geese idea. Thank you for sharing and have a fabulous evening! Getting a late start and just now catching up to January block….I found copy of book, 1st Edition on ebay….the hanging cup pattern is in it too….page 53. I’m using 1950’s looking fabrics—-red, turquoise, white, grey and black. The color scheme reminds me of my mom’s kitchen growing up. I wish I had the vintage kitchen table and chairs—-red formica table top and gray and red plastic chairs. She sold it to a cousin when I was in high school in the 70’s and it was still in near perfect condition.